Backed by qualified professionals, we are providing a comprehensive range of Roll Up Promotional Standee. Keeping in sync with the latest fashion trends, we are engaged in providing a trendy array of Roll Up Aluminum Standee. We are the most trusted name amongst the topmost companies in this business, instrumental in presenting Iron Standee. 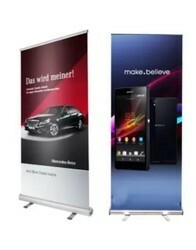 We prints banners and stand banners. Will be printed as per you size requirement and design. Will be printed as low as Rs. 10/sqft at any color, any design, any size you want. 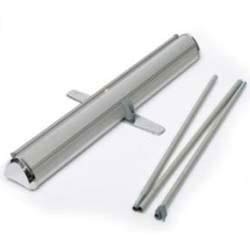 Being a leading manufacturer, we are engaged in supplying superior quality range of Pull-up Banner Stands. Manufactured using finest grade raw material, these banner display stands are widely appreciated for their quality features like classy colors, durability and smooth designs.